In ClearCase, if I am working on some file X and want to also see its previous version (say version 5), it is available as X@@/main/5. Is something similar available with other (preferably free) version control systems? Mercurial has hg cat and hg co, but they still do not come close to ClearCase's feature above. gitfs is a FUSE-based filesystem for working with source trees stored in git repositories. The eventual goal is to provide a convenient way to work with lots of branches and patches. Currently only very basic functionality is implemented -- read-only access to the existing tags and objects. There are likely other (more active) projects offering similar features (both for Git and other VCSes). First, X@@/main/5 is an extended pathname which you can really explore only in dynamic views. See "How to retrieve a single file from specific revision in Git?" for more. gitfs FUSE-based filesystem for working with source trees stored in git repositories. figfs (the Filesystem Interface to Git FileSystem), which expands on gitfs. The repository is presented as a filesystem which allows multiple versions and branches of the project code to be viewed simultaneously and without the need to reconfigure the user's workspace. 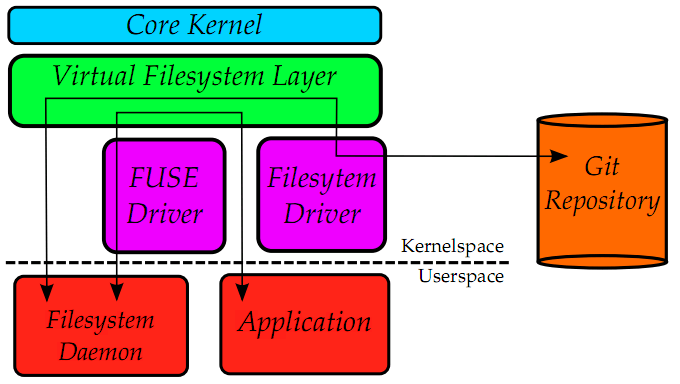 A FUSE application allows a ﬁlesystem to be implemented as a user-space process. An application’s request is passed through the VFS layer and into the FUSE driver which sends the request to the user space ﬁlesystem daemon. Figfs then accesses the Git repository through the normal ﬁlesystem and returns the resulting data to the application. Basically every hg command you would want to handle an arbitrary revision can - using -r in hg is just like using @@ in clearcase all the time. hg "only" needs -r because files aren't versioned independently of the repository, so given a file and a repo version, -r is unambiguous. If you want to edit a file, piping hg cat is exactly like reading file@@/branch/ver - they provide exactly the same (read-only) access to the data. If you want the convenience of dynamic views over MVFS in Mercurial, that's an entirely different problem and you can't really do it (you can do it read-only over NFS, but obviously there's no versioning there). Not the answer you're looking for? Browse other questions tagged git mercurial clearcase or ask your own question. How do I roll back a file checked in to Clearcase? Why can't Perl find my file that is in ClearCase? How can I see what I am about to push with git? Clearcase: how to not have garbage while working with hijacked files?